Are you teaching young students to form letters? Try these movements and activities to increase your student’s memory and decrease instances of letter reversals. The Cross Crawl exercise involves reaching across the midline of the body to touch the opposite knee or foot. This may be done while sitting, standing or hopping. During this activity the student also crosses midline with her eyes—a skill that helps children recognize and form diagonal letters such as “X” and “Y”. Crossing midline during movement helps the brain’s right and left hemispheres communicate and promotes visual perceptual skills. Children can begin the school day doing cross crawls in the gym or outdoors since it is best to perform these exercises in a spacious area. 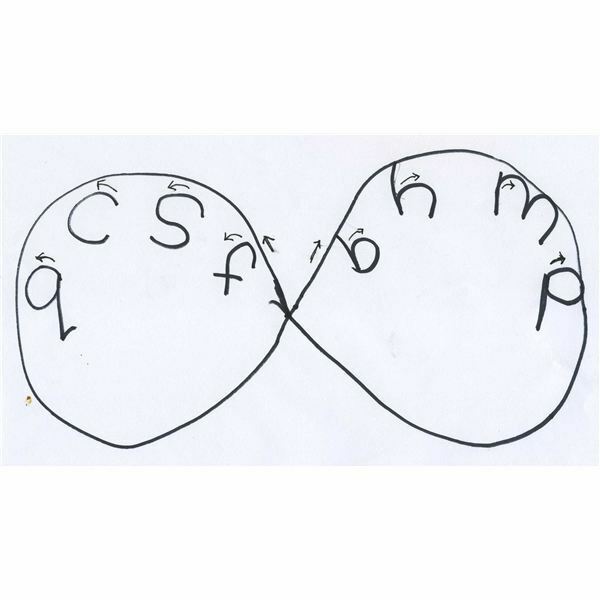 The Lazy Eights exercise involves tracing a large horizontal eight or infinity sign three to five times with the right hand, left hand and with both hands on one marker. These circular movements promote crossing midline and develop visual tacking skills as the student watches her hands move. These movements also develop the rhythm to form letters and prepares the student to perform the next exercise-Alphabet Eights. Children can also practice forming Lazy Eights using only their eyes while performing other Brain Gym ideas such as the Brain buttons (described below). letters inside the two circles starting at the center where the curved lines intersect. Letters such as “S", “f", “C" and “o" that are formed with right to left movements are written in the left circle, while working right to left. Letters such as "m", “r" or “K" that are formed with straight lines that move to the right are written in the large circle on the right, forming letters in the left to right direction. The activity reinforces forming letters with correct directionality. The Brain Button exercises involve placing one hand over the belly while the other hand presses against points below the collar bone. The theory is that pressing these points stimulates blood flow and the vestibular system that helps the brain to interpret visual information. Children can be taught to engage in visual tracking activities such as running the eyes across the lines where the ceiling and walls meet while performing the Brain Button. Several other Brain Gym ideas can be integrated into the school day with the goal of reinforcing correct letter formation. For example, while engaging in the Cross Crawl exercises children can wear tags with commonly reversed three letter words written on them—such as “saw" and “was"–reading them as they move. Children can spell words while tracing the Lazy Eights and also form letters while doing the Double Doodle. This activity involves grasping two markers while standing in front of a board and “doodling" identical shapes or letters with each hand. These are just a few ideas that can be adapted to use with children of all ages. Activities for preschool children can focus on learning shapes, kindergarten lessons should focus on letter identification and older children can spell, read or trace words using their eyes and/or fingers as they move their bodies.